Whether you’re an expert angler or just starting to dip your toes in the sport, you can never be too prepared for your first fly-in fishing trip. Here are a few things to know before you take to the sky! Your fishing licence is split up into two parts and you need both before you hit the open water. There’s the fishing licence tag and the Outdoors Card; each serve a different purpose and you must carry them both whenever you go fishing. Learn more about your fishing licence in our previous blog post! Most anglers over pack on their first fly-in fishing trip, so you’ve been warned! You don’t need nearly as much fishing equipment or clothing as you think you do and you’ll realize that the moment you step on the plane. 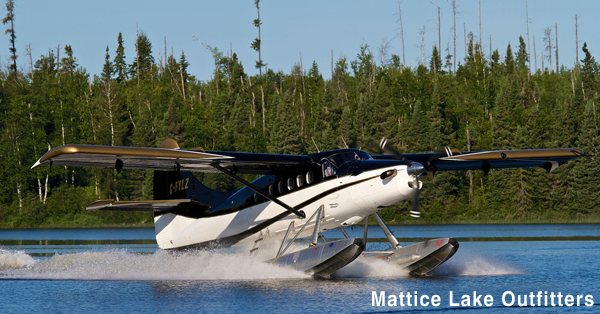 Make sure you check with your fly-in fishing outfitter about the weight limit for their specific plane. Although we recommend that you don’t pack your whole wardrobe for the trip, it’s still important that you come prepared for any type of weather conditions. Take the season into consideration, and prepare for warm and cold days, especially with the unpredictable Ontario weather. And when we mentioned packing a rain suit, we meant it! Quality apparel to combat the rain will save you from a potentially damp fishing trip. Now that you have expertly prepared for your first fly-in fishing trip, it’s time to find the right camp. At Mattice Lake Outfitters located along the peaceful shores of the Ogoki-Albany river system offers anglers an unbelievable fly-in fishing experience. Give us a call at 1-800-411-0334 today to learn more about our various fly-in fishing camps and start planning your trip!